The Energy Performance page presents energy consumption by each major electrical circuit in the house, including lighting. The Photovoltaics (PV) page sets out how we sized our PV system according to expected energy usage within the house, which is affected by lighting efficiency. As one of the components of the house that consumes energy, well thought-out lighting plays an important part in helping us meet the Zero Energy goal. A 2006 study by BRANZ found the typical New Zealand house consumes around 12% of its electricity in lighting1. Zero Energy means we need to produce as much energy as we consume, so cutting that 12% down as much as we can allows us to reduce the size of the solar system on the roof. And because lights are used at night, we're not able to directly power them with solar. Instead, we rely on our grid connection to provide the energy (and sell surplus energy generated during the day to make up for it). This makes it even more important to minimise the energy consumption from lighting - the energy we produce on the roof is free, but the margin between what our energy provider buys our energy and sells it back to us for means that - from an economic point of view - we should reduce grid-purchased electricity as much as possible. Zero Energy Lighting gives an overview of our design approach to lighting, discusses the reasoning behind going all-LED, and shows some of the Philips LED products used. 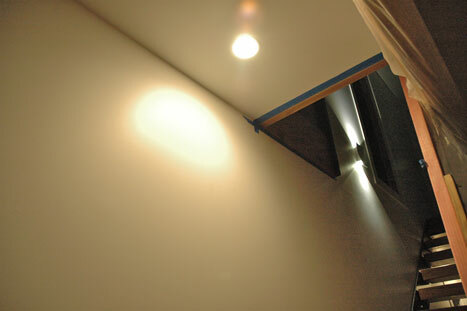 SmartBright downlight and Ledino wall light above the stairs. Jo and her colleagues at eCubed Building Workshop collaborated on the lighting design for the house. Lighting design is an important step in constructing a home and involves looking at how different rooms in a house will be used and working out the lighting requirements that suit that expected use. Whether lights will need to be dimmed. Each area of the house is lit according to its specific needs, which means the right amount of light is delivered to make each area work as it should. The number of lights and the amount of luminance required for the house is minimised, which reduces the costs of the bulbs themselves, the installation time from electricians, and the operating cost over the life of the house. One area of house design that is often not thought about when it comes to lighting is the impact of the surrounding areas on light performance. Studies have found that as much as a third of the energy use of lighting can be impacted by factors such as ceiling heights, and the colour and reflectivity of paints2. It's therefore important to consider lighting as part of the overall integrated design process, not just something left til last. Selection of Philips LED bulbs awaiting installation. Energy efficiency. Like compact fluorescents, LED lights can use 80% less energy than an incandescent bulb. The 12% of household electricity for lighting found in the BRANZ study equates to around $240 a year; cutting that back by 80% achieves a saving of around $190 a year. Long-life. This is what sets LEDs apart. An LED bulb can last up to five times longer than a compact fluorescent. While LEDs can cost a bit more up-front, this extremely long life delivers more savings over the life of the bulb. Materials. LEDs contain no mercury, unlike compact fluorescents. And, because of their extremely long life, LED bulbs don't need replacing anywhere near as often. This reduces the materials needed in manufacturing replacement bulbs, and also reduces the volume of materials requiring disposal. One change we made in the house that really highlighted the difference LEDs can make was the replacement of the standard halogen bulbs that shipped with the kitchen rangehood. Our lighting plan for the kitchen involved the installation of four SmartBright ceiling downlights totalling 60W. The two 50W halogen bulbs that shipped with the rangehood would have consumed almost twice as much energy as the rest of the kitchen lighting combined, so we replaced them with two 6W bulbs with comparable light intensity and quality from the Master LED range. All the lights in the house use LED bulbs from Philips. They consume as much energy as comparable CFL bulbs, but can last up to five times longer and contain no mercury. Philips invests heavily in the R&D of new LED lighting products and their expertise in the area proved valuable in ensuring we had a range of products that met our requirements. 18 SmartBright ceiling downlights, which use up to 60% less energy than conventional compact fluorescent downlights. 3 Ledino integrated wall lights that have an expected bulb lifetime of 20 years. Bulbs throughout the house are from the Master LED range, with lifetimes of between 25,000 and 40,000 hours. Philips is a leader in energy efficient lighting solutions and is investing heavily in improving on and developing new LED products. Their wide range of LED solutions are valuable in deploying a targeted lighting plan like the one we formulated for the Zero Energy House. Building Research Association New Zealand (BRANZ). (2006). Energy use in New Zealand households: Report on the year 10 analysis for the household energy end-use project (HEEP). p12. 12th Conference of International Building Performance Simulation Association (2011). Effect of Surface Reflectance on Lighting Efficiency in Interiors. p2302.